Liquidity X is a proprietary dark pool trading system which allows clients to source liquidity in low liquidity names. 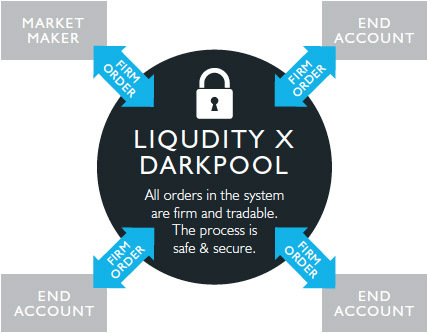 Liquidity X is a proprietary dark pool trading system which allows clients to source liquidity in low liquidity names and which guarantees complete confidentiality and anonymity for the client. There is no leakage of order information to any counterparty or third party unless a trade is executed within the system. Liquidity X is not a price discovery platform. It is a dark pool designed specifically for firm and genuine trading orders. Liquidity X does not disclose any order that does not trade unless specified by both the buyer and the seller. Both sides are required to be best bid and best ask respectively. Orders are driven by the counterparties. Traders will only submit ISINs when they have genuine interest. Using directed tolerance levels on prices. The size remains anonymous unless traded in full.